Soccer Referee Dies, One Week After Being Felled By Punch : The Two-Way A soccer referee who was punched by a player after calling a foul on him during a recreation soccer game in Utah died Saturday night, one week after he sustained the injury. The suspect, 17, who received a yellow card penalty from referee Ricardo Portillo, was arrested Monday. 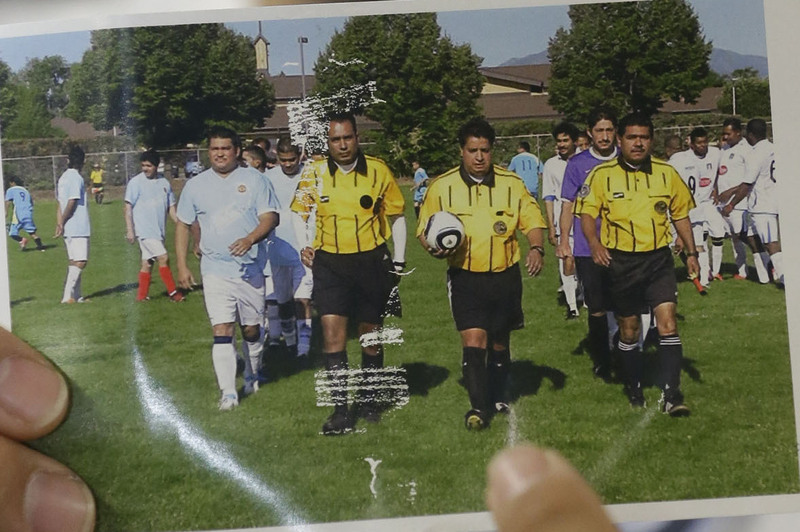 Soccer referee Ricardo Portillo died Saturday, after being struck by a player. 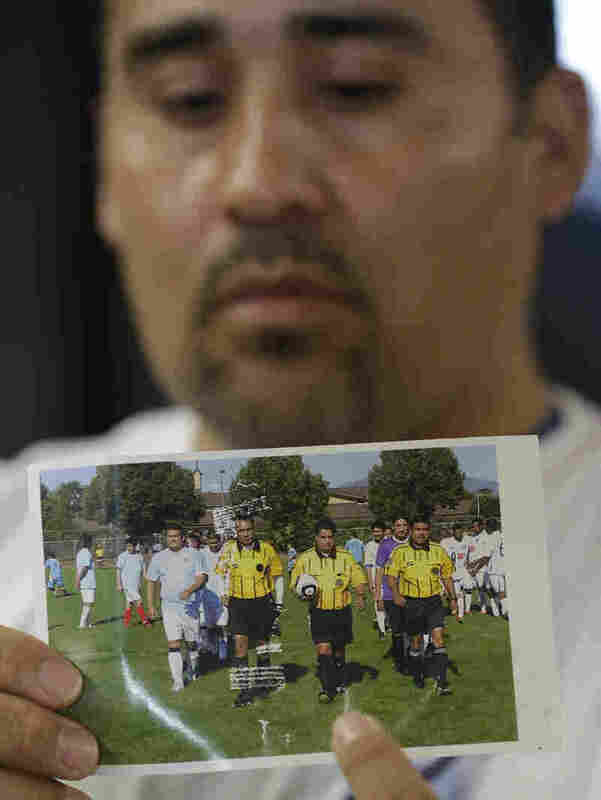 Here, Portfillo, is seen holding a soccer ball, in a photo held by his brother-in-law, Jose Lopez, Thursday. A soccer referee who was punched by a player after calling a foul on him during a recreational soccer game in Utah died Saturday night, a week after he was hit once in the face. The suspect, who received a yellow card penalty from referee Ricardo Portillo, was arrested Monday and remains incarcerated, officials say. The incident seems to have been sparked by a call made by the referee during a corner kick, according to a police report obtained by The Salt Lake City Tribune. Portillo judged that the player, a goalie, had shoved an opposing player; he called a foul on him. "The suspect was close to Portillo and punched him once in the face as a result of the call. It was initially believed that Portillo had minor injuries as a result of the assault," according to a Greater Salt Lake police release. "However, he was transported by ambulance to Intermountain Medical Center and was found to have serious internal head injuries. He was listed in critical condition." At the hospital, Portillo lapsed into a coma; he reportedly did not come out of it this week. Utah's KSL TV reports that he suffered from "extreme swelling of the brain, blood loss and bleeding around the blood vessels in one area of his brain." The suspect, 17, has not been identified because he is a minor. The Tribune reports that he was a new player for his team in what seems to have been an unofficial league. The game was played on a junior high school field in Taylorsville, Utah, southwest of downtown Salt Lake City. The player was arrested for investigation of charges of aggravated assault; police have previously said that the district attorney would review more charges depending on Portillo's health. Speaking to media outlets Thursday, Portillo's daughter Johana Portillo, 26, said, "I just want justice for my dad and we're gonna get it," according to The Tribune. She also said that no punishment would "bring my daddy back." This wasn't the first time Portillo had been injured while officiating a game, his daughter said. "Five years ago, a player upset with a call broke his ribs," the AP reported Friday. "A few years before that, a player broke his leg, she said. Other referees have been hurt, too." Johana Portillo says she and her sister, Ana, tried to get their father to quit, but his love for soccer kept him on the field. The league Portillo worked in, La Liga Continental de Futbol, has said it will hire off-duty police officers to provide security at games. The league, which reportedly expelled the suspect's team, has also received a warning from the school district.